Without a doubt, the two strangest — and most controversial — place-names in Delaware are Whorekill and Murderkill. 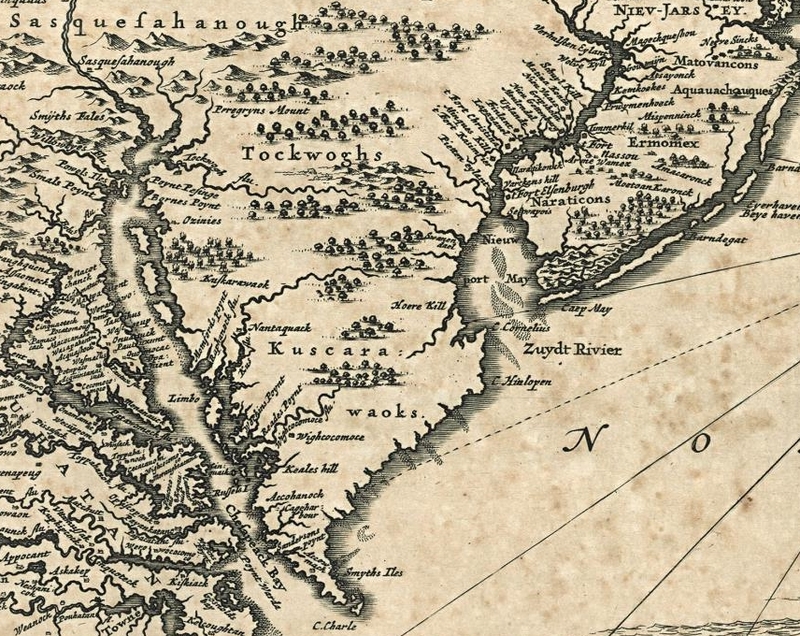 Whorekill was an early name for Lewes Creek and the town of Lewes, while the Murderkill River flows through southern Kent County and into the Delaware Bay, and is the source of the names North Murderkill Hundred and South Murderkill Hundred. Kill dates back to the Dutch occupation of the region, and simply means “creek.” So — Whore Creek? Murder Creek? What’s going on here? As recently as 2014, the News Journal published a mythbusting sort of article, assuring readers that the odd names are simply English corruptions of the Dutch terms for Hoorn Creek and Mother Creek, respectively, Hoorn being a Dutch city to which some of the early settlers were connected. Although this seems like a very reasonable explanation — after all, the Dutch moeder is fairly similar to the English murder, and the name Hornkill does appear in some records — I’ve come to believe that there is stronger evidence for the names meaning exactly what they seem to mean. Let’s take a look at the Lewes area first, and save Murderkill for another post. The Dutch established the short-lived Zwaanendael settlement there in 1631, and called the creek Blommaert’s Kill in honor of Samuel Blommaert, one of the directors of the Dutch West India Company who had purchased the tract from the local Indians, who massacred the settlers shortly thereafter. However, the creek was called Hoeren-kil as early as 1640, and Hoere-kil as early as 1642. Hoere means whore, harlot, prostitute, etc., and hoeren is simply the plural form of the term; the obvious translation is Whores Creek or Whore Creek. Section of a copy of Jan Jansson’s map of the New Netherlands, 1651, incorporating much of the information from John Smith’s map of 1612, and erroneously placing Cape Hinlopen at Fenwick Island. 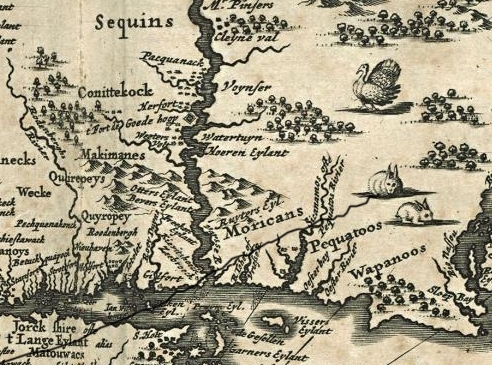 There was also a Hoeren Eylant (island) in what is now the Connecticut River. Later writers explained both names as originating from local Indian prostitution or sharing of women. Notice Lange Eylant (Long Island) near the bottom, and Hoeren Eylant near the center. An alternative, but somewhat speculative translation could be Mud Creek, based on the rather obscure Middle Dutch word hore or hor, meaning mud, excrement, filth, etc., from the Old High German word hore. Interestingly, it has been suggested that both the English whore and the Dutch hoere could be derived from slang referring to prostitutes as filth or scum. I have never heard or read of anyone suggesting this translation, nor am I arguing in favor of this possibility. I just think it needs to be mentioned, and perhaps investigated further by an authority on 17th-century Dutch. There is one reason, in particular, that leads me to believe that “whore” is indeed the correct translation, and it requires an understanding of the history of the area. Following the disastrous destruction of Zwaanendael, both the Dutch and the Swedes more or less left the Hoere Kill alone until a Dutch Mennonite named Pieter Plockhoy established a small settlement nearby with forty-one settlers in 1663. The settlement was destroyed by English forces less than a year later, but there is evidence that some of the colonists not only survived the attack, but continued to live in the area. A 1671 census indicates that there were several Dutch households in the town known as Horekill or Whorekill. I’m guessing that the old Hoere Kill became Whorekill not because the English mistranslated a Dutch name, but because the Dutch locals stayed put, became English subjects and learned the language, and translated the name themselves. Hoere and whore were so similar that the spoken name really didn’t even change, only its spelling. On the other hand, the theory that the creek was named after Hoorn not only requires us to assume that the English botched the name (which would be understandable), but that the Dutch themselves consistently misspelled the name from the very beginning of its use. They did not make this error with other sites named after Hoorn, such as Kaap Hoorn (Cape Horn) in South America. I have trouble believing that Dutch mapmakers who were well aware of the spelling of the important city of Hoorn (see any map of the Netherlands of that period) would have gotten it so badly wrong on maps of the American colony, not only misspelling it but substituting the word for prostitute. I also have trouble believing that rough Dutch seamen, soldiers, fur traders, and the like would have objected to naming a site on the wild frontier after prostitution on moral grounds — particularly since generations of respectable English colonists (and then American citizens) continued to use the name Whorekill even after the town had been renamed Lewes. 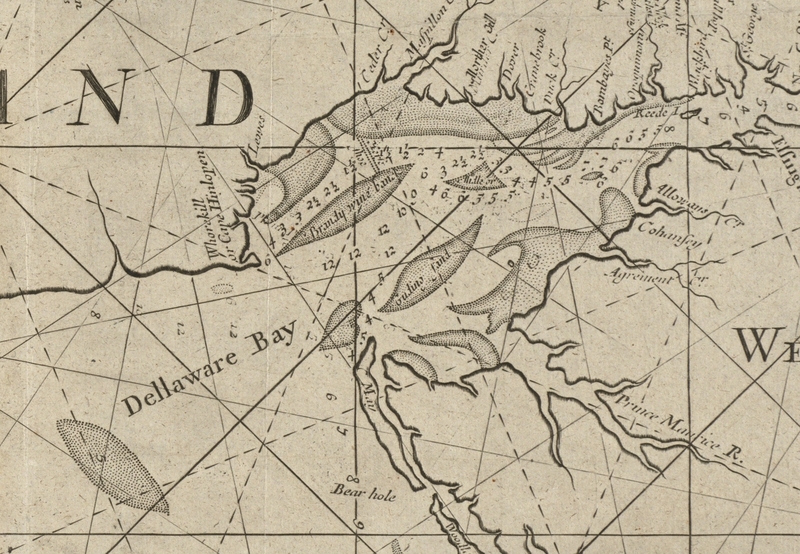 Thornton’s map of 1706 shows Whorekill as an alternate name for Cape Henlopen. It is my position at this time, while keeping an open mind, that the occasional usage of Hornkill in Swedish and English records was an alternative spelling of the original Hoeren-kil, and that the English name Whorekill did, in fact, accurately reflect some association with prostitution. If I were to propose an alternative explanation for the name, I would point to the similar Middle Dutch words for mud, which would make sense in the context of naming a creek. I think the explanation involving the city of Hoorn is the weakest of all, and is perhaps based more on a desire to whitewash history than on primary sources like Dutch maps and records which clearly use Hoeren or Hoere, not Hoorn.